Sup­port local music and check out my new track “Dis­in­te­grate Me Gen­tly” on The Res­o­nant Fre­quen­cies Elec­tron­ic Open Mic’s first artist com­pi­la­tion! After 13 years col­lect­ing vir­tu­al dust on my hard dri­ve, I’m grate­ful to be releas­ing this EP for free on Band­camp. Please down­load, share, and let me know what you think! In an attempt to get my tracks to sound more like the tunes I like to DJ, I ran across an arti­cle about how club sub freq’s can range down to about 40Hz, which is just below the note E1. The arti­cle (wish I could find it again) men­tioned that’s why a bunch of tracks are in F and G — because those root bass notes fall com­fort­ably in the range that can be played back. A low F1 note is prob­a­bly one of those tones that sounds KILLER on a good rig. Look­ing at some of my favorite house, tech­no, and deep tech tracks from 2017, I noticed that most are in F, Bb, Eb, G, or C. I’m not sure my analy­sis soft­ware (djay Pro 2) is dis­cern­ing major vs minor here. 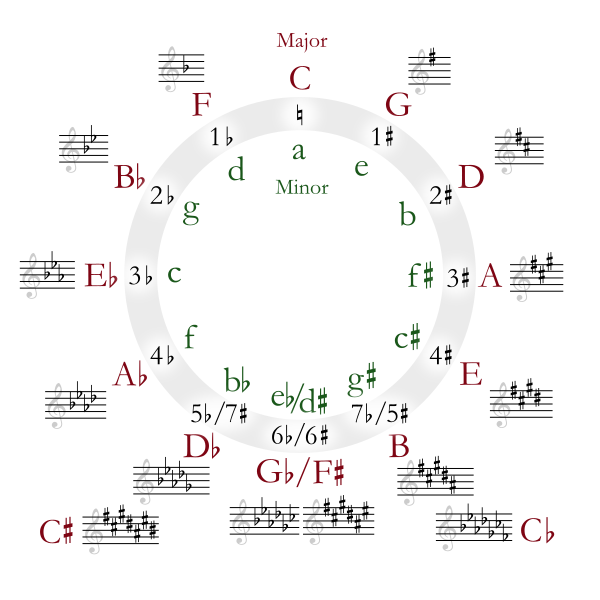 … those keys are all clus­tered in the upper-left cor­ner, which means that they will be easy to tran­si­tion to dur­ing a set because jumps to neigh­bor­ing keys in the cir­cle of fifths sound good. Now inter­est­ing­ly, this guy’s analy­sis of the Beat­port Top 100 Tracks showed a dif­fer­ent set of pop­u­lar keys — but I don’t play tracks as “Pop”-y as the Top 100. Who knows. This is a mid-side stereo patch explor­ing ways of spread­ing the var­i­ous out­puts from the DPO around the stereo field. The DPO sends 6 wave­forms to the RxMx. The low­er-num­bered RxMx chan­nels are fed fun­da­men­tals, and become the “mid” sig­nal. The high­er chan­nels have increas­ing­ly spec­tral­ly-rich oscil­la­tors, and become the “side” sig­nal. Maths is used to invert the “Side” sig­nal and sub­tract it from “Mid”. The Optomix is used to add these two togeth­er. That way, we have the L and R sig­nals. I’m fil­ter­ing the Side sig­nal via the MMG, which allows for fil­ter­sweeps that only hap­pen in stereo. It’s also a good idea to scoop out the fre­quen­cy range occu­pied by the Mid sig­nal with a high­pass so the decod­ed sound isn’t as hol­low. One of the many beau­ties of MS encod­ing is you can do stereo fil­ter­ing (of sorts), using mono fil­ters / effects. One inter­est­ing part is cal­i­brat­ing the lev­els of chan­nels 2 and 3 on Maths to get the bal­ance right. Set the RxMx chan­nel and radi­ate con­trols so you only hear chan­nel 1. This should be pure “Mid”. Adjust Maths Ch 2 so that the L and R out­puts are the same lev­el. Next, set the RxMx so you only hear chan­nel 6 — this should be pure “Side”. Adjust Ch 3 on Maths in the neg­a­tive until the L and R chan­nels have a rough­ly equal lev­el. The sound should be com­plete­ly phase-invert­ed from left to right. Now, set­ting chan­nel and radi­ate should mix between mono and stereo imag­ing, with the high­er har­mon­ics appear­ing main­ly in the stereo field. Things can get pret­ty nuts of you tune Oscil­la­tor A and B to dif­fer­ent fre­quen­cies. I got a mod­u­lar piece accept­ed on the Make Noise Records “Shared Sys­tem Series” com­pi­la­tion today! The series is intend­ed to show­case artists using the MakeNoise SharedSys­tem rig to make a live com­po­si­tion, with no over­dubs and no exter­nal effects (except an option­al reverb). Out now on Beat­port via Har­mo­nious Dis­cord Record­ings, fea­tur­ing remix­es by Evan Marc (aka Bluetech) and Patchen Pre­ston. Art­work by ellisett. So I recent­ly got a MakeNoise SharedSys­tem mod­u­lar rig, and one thing miss­ing from it was an appar­ent lack of the abil­i­ty to make… noise. White noise. How­ev­er, by push­ing the Wog­gle­bug and the DPO’s inter­nal mod­u­la­tion rout­ing to the extreme, you can get some decent-sound­ing white noise. Basi­cal­ly, you turn most of the knobs on both mod­ules all the way clock­wise and lis­ten to the DPO final out­put. This is a very sim­ple trick to do, but not so obvi­ous to fig­ure out that it’s even pos­si­ble. The idea is to sidechain com­press the pro­cess­ing on a Return bus by its own input sig­nal, in order to clear out some “emp­ty” space around the dry sig­nal. It’s like mak­ing a “breath­ing fx bus”. For exam­ple, if you have a stac­ca­to vocal sam­ple being sent into a reverb or a delay, using this trick the effect tails will “swell in” over time after the dry sig­nal stops. It’s sim­i­lar to kick sidechain­ing. Send sound from an Audio track to a Return track. On the Return track, add a plu­g­in that cre­ates a tem­po­ral tail: ie reverb or delay. Add a com­pres­sor after the fx. Enable Sidechain, and set the Audio From drop­down to the same Return track you’re on. Set the Audio From posi­tion to “Pre FX” in order to sidechain from the dry sig­nal. Set up your thresh­old, release, ratio etc. to get your desired “halo” pump­ing sound around the input sig­nal. So I’ve had a Ruin & Wesen Mini­Com­mand for a lit­tle under a year, but haven’t been using it as much as I would like because it didn’t inte­grate well with my set­up — until last night. The stan­dard way to use the Mini­Com­mand is to con­nect it in a closed MIDI loop with the device in ques­tion — which makes it hard use in a com­put­er-based MIDI set­up with a sequencer. There are ways around this, eg. daisy-chain­ing the Mini­Com­mand between the computer’s MIDI inter­face and the device you want to con­trol, but I have found that this intro­duces some small tim­ing delays (enough to dri­ve me crazy).